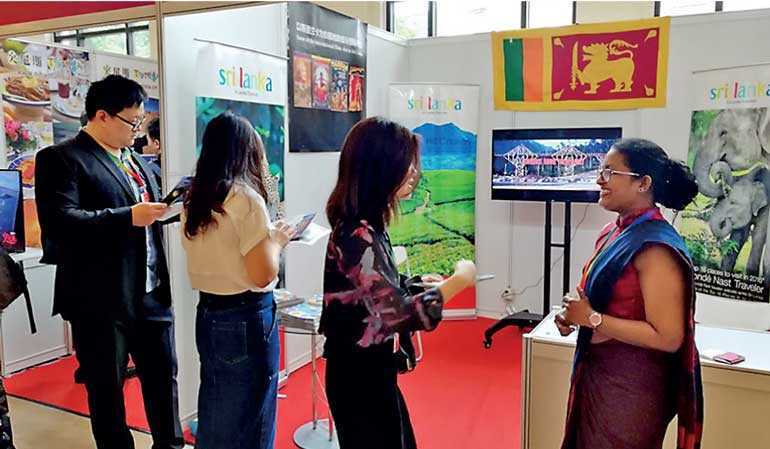 The Embassy of Sri Lanka in Beijing participated in the 15th International Film and TV Programme Exhibition, which was held from 17 to 19 May in Beijing under the theme ‘New Era, New Accomplishments and New chapter’. Chinese and International media agencies participated in the exhibition along with a number of diplomatic missions including Norway, Greece, Armenia, Bulgaria, South Korea, Ethiopia, Senegal, Philippines, Tunisia, Benin, Uruguay and Zimbabwe. The event was hosted by the China Media Group which had been officially inaugurated on 19 April this year combining the China Central Television (CCTV), China Global Television Network (CGTN), China National Radio (CNR) and China Radio International (CRI). In addition, news television stations, diplomatic missions, film and television production companies as well as major media websites in China had booths at the Exhibition. The booth of the Embassy of Sri Lanka showcased Sri Lanka’s filming locations and information on international films shot in Sri Lanka. Clips from those films were screened and their posters were displayed. Representing the Embassy Second Secretary Inoka Weerasinghe participated in the event and invited Chinese film and TV producers to use filming locations in Sri Lanka for their productions and to telecast Sri Lankan TV programs in Chinese media, dubbed in Chinese or with Chinese subtitles.